Set to hit cinemas in November, Fantastic Beasts 2's final trailer has been unveiled. Watch it here, and find out everything we know so far about the Harry Potter spinoff. Fantastic Beasts: The Crimes of Grindelwald is coming, and we couldn’t be more excited. It’s the second in the Fantastic Beasts series, a Harry Potter spinoff set in J.K. Rowling’s Wizarding World. Here, you’ll find out when the Fantastic Beasts 2 is coming out, who’s in it and what we know about the plot. You can also watch the final trailer and those that came before it. Click here to see our full review. Also see our article on if there's a post credit scene and any Easter eggs. When is Fantastic Beasts 2 coming out on Blu-ray and DVD? Fantastic Beasts: The Crimes of Grindelwald hit cinemas on 16 November 2018, which means it isn't long until it comes out on home entertainment. As usual, the US gets the film first, with a digital release on 15 February and the physical copies following on 12 March. Luckily the UK doesn't have to wait too much longer though - here the digital copy comes out on 9 March, with discs a little later on 18 March. If you've yet to see the first movie in the series, you'll find it available to stream on Now TV or to buy from Amazon here. Returning for the second movie are some of the actors and characters we got to know in the first. Main character Newt Scamander is played by Eddie Redmayne, and you’ll Dan Fogler is Jacob Kowalski. Katherine Waterston and Alison Sudol also return as Tina and Queenie Goldstein, while Ezra Miller plays Credence Barebone. Right at the end of Fantastic Beasts and Where to Find Them, we got a glimpse of Johnny Depp in the role of Gellert Grindelwald, who, as you can tell by its title, is set to play a much bigger part in the new movie. New to the cast is Jude Law as a young Albus Dumbledore, and further new faces include Zoe Kravitz as Leta Lestrange and Callum Turner as Theseus Scamander. The final trailer revealed that actress Claudia Kim's character, new to the cast, is in fact a very familiar one for Harry Potter fans. Later in life, she becomes Voldermort's snake and one of his Horcruxes, Nagini. Harry Potter author J. K Rowling has now confirmed that Nagini was once human, but rather than being an animagus such as Sirius Black (who can become a dog) or Progessor McGonagall (a cat), she is in fact a Maledictus, which is a female whose blood is cursed from birth. Eventually, this curse forces them to become a beast. The film is directed by David Yates, who directed the final four instalments in the Harry Potter series as well as the first in the Fantastic Beasts series. The screenplay has been written by J. K. Rowling. Unlike the Harry Potter movies themselves, the Fantastic Beasts series plot is a secret until the films land in cinemas. We knew and loved the Harry Potter books before the movies were released, but this time it’s movie first, book second. 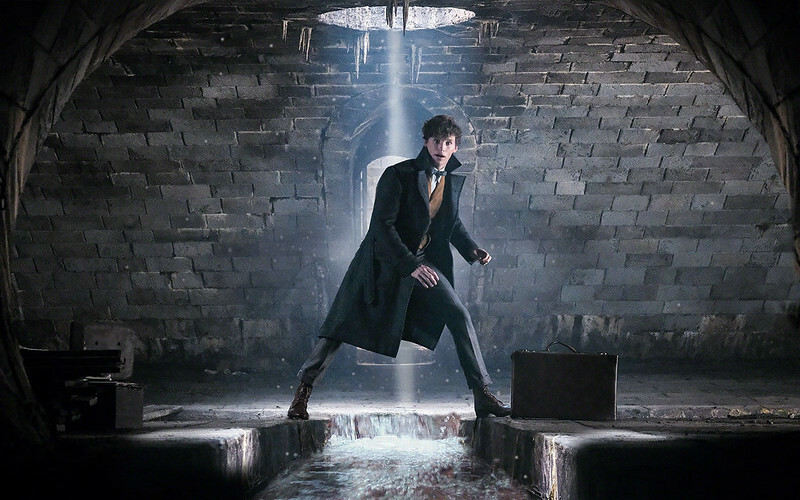 The series was inspired by the fictional book of the same name that Harry and his friends were required to read as part of the Hogwarts curriculum, written by Newt Scamander himself. Following its release in cinemas, the screenplay (written by J.K. Rowling) was published as a book, and we expect the same to be true with the second movie. That hasn’t stopped speculation about what’s in store for fans. The first trailer revealed we’ll be returning to Hogwarts, and we already know that we’re set to find out more about Albus Dumbledore and his battle with dark wizard Gellert Grindelwald. That very battle was first mentioned in the first Harry Potter book: Harry Potter and the Philosopher's Stone, so it won’t come as a surprise to fans. At the end of the first film, we see Grindelwald captured by MACUSA (Magical Congress of the United States of America), but two years on the powerful wizard has managed to escape custody and is gathering followers. Unlike Voldermort’s followers, many of Grindelwald’s aren’t aware that his true agenda is to raise pure-blood wizards up to rule over the non-magical beings (Muggles, No-Majs). In an attempt to stop him, Dumbledore (then a Transfiguration professor) enlists the help of Newt. In an interview with Entertainment Weekly, Law surprised fans by revealing that he and Depp don't actually share any scenes in the movie, which means Dumbledore and Grindelwald won't be seen together this time. "I don't actually have any scenes with Johnny," he revealed. "This is only part 2 of a longer story. I've always admired him from afar, but we don't know each other, and I've not yet met him on this." He went on to explain that the situation suits the relationship between Dumbledore and Grindelwald. "It's been many years since they've seen each other. So there's complexity in that that's fun to mine. Again, the past will reveal itself." We had expected to see the pair together in this film, as their early lives were very much intertwined and much of the reason Newt finds himself in conflict with Grindelwald is down to Dumbledore. "Not explicitly. But I think all the fans are aware of that. He had a very intense relationship with Grindelwald when they were young men. They fell in love with each other's idea, and ideology and each other." We're hoping to see more about their relationship in future installments in the series if not in this one. At a press conference in 2016, Rowling said: "I can't tell you everything I would like to say because this is obviously a five-part story so there's lots to unpack in that relationship. You'll see Dumbledore as a younger man and quite a troubled man - he wasn't always the sage... We'll see him at that formative period of his life. As far as his sexuality is concerned... watch this space." Law has also said "you're just getting to know Albus in this film, and there's obviously a lot more to come. We learn a little about his past in the beginning of this film, and characters and their relationships will unfold naturally which I'm excited to reveal. But we're not going to reveal everything all at once." Back in 2016, IMDB seemed to leak plot details of the second Fantastic Beasts movie. It took the summary down when it realised its mistake, but not before The Leaky Cauldron caught it and published it on its blog. If it’s to be believed, the leak suggests it’s been two years since the end of the last movie, and Newt is living back in the UK. He has published his book, and is finally over Leta Lestrange. The first trailer gave also further clues about the plot. Jacob is back (and appears to have his memories back? ), Newt’s brother Theseus is set to make an appearance and we’re going on a trip to Paris. Leta Lestrange will be introduced, and we already know she was a former love interest of Newt’s that betrayed him. We also spotted Credence in the second trailer, suggesting he managed to survive, and got a glimpse of the Philosopher's Stone creator Nicolas Flamel. Plus, as mentioned above, the biggest news from the final trailer is that Nagini was once human. We can't wait to find out more about that! Do you have any theories about Crimes of Grindelwald? Let us know in the comments section below or on Twitter. We've seen several official images from the movie to give us a glimpse at what to expect when it hits cinemas later this year. There's also a poster for the film, and we expect to see several more as the release date approaches. There are three trailers for The Crimes of Grindelwald, with the third being the final trailer before the movie arrives in November. The first, shown below, was released on 13 March 2018, giving us our first glimpse at what's in store. 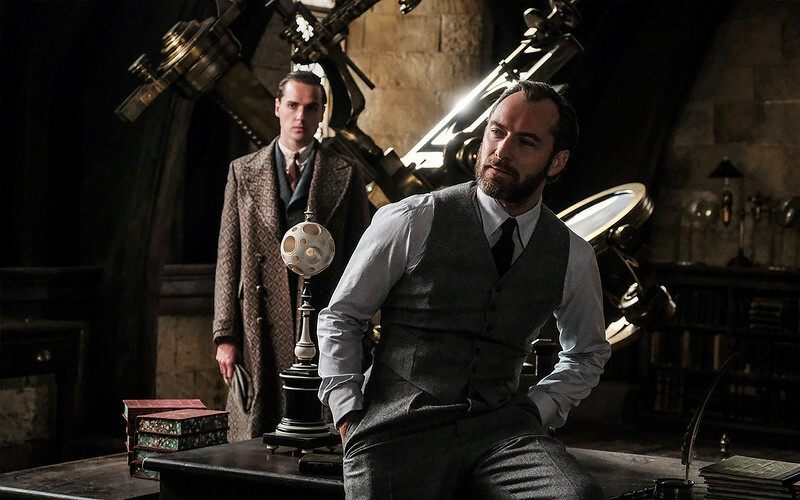 We see Jude Law in his role as Dumbledore, and discover that we're set to return to Hogwarts. The second is from San Diego Comic Con on 21 July, and is shown below. The third and final trailer is available to watch at the top of this article, after being unveiled on 25 September.